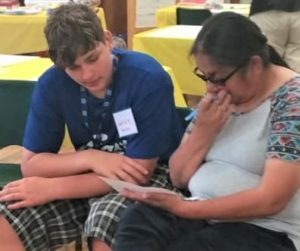 This year’s DAREarts Summer Camp ran August 7-14 for 27 youths from Toronto and 8 youths from the fly-in-only community of Webequie First Nation! Here’s diversity and inclusion at its finest as the Indigenous and non-Indigenous teens shared their real life challenges as they collectively created art, music and drama. They were engaged by director Jennifer Parr, artist Cortney Stephenson, DAREarts teachers Laura MacKinnon and Franco Saccucci, and DAREarts alumni as youth mentors, led by Dante Scholar. 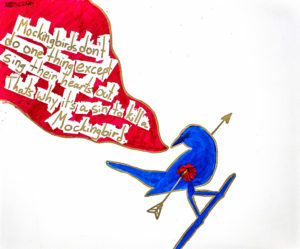 All were inspired by Harper Lee’s To Kill a Mockingbird and the production by The Stratford Festival. Following the Stratford production, the youths engaged in a Q&A session with actors, Matthew G. Brown and Jonelle Gunderson, Stratford Festival’s Artistic Director, Antoni Cimolino, and MPs Erin O’Toole and John Nater. The camp culminated with an extraordinary presentation in Toronto by the youths. 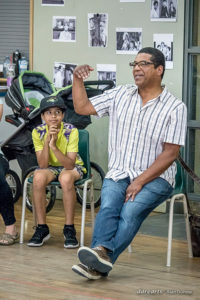 Their presentation included artwork, alongside a ‘cross the line’ activity where audience members and campers together shared their experiences of inclusion, belonging, and justice: themes that related to the play. Nigel Williams, Director of Stratford’s production, joined our youth for their performance, followed by an energetic conversation with the entire audience. Our final time together was breakfast at Caldwell Securities, hosted by Tom Caldwell who gifted each youth with their own personally autographed copy of his inspirational book called ‘The Success Dictionary.’ DAREarts values of Discipline, Action, Responsibility and Excellence – are all there! Our youths have plenty to dream and achieve! With DAREarts, they DARE to step outside of limits and engage in positive risk taking. As they collaboratively create, they can distance themselves from their life challenges and enjoy a supportive atmosphere. As our programs grow, we ensure that they are relevant by addressing current social challenges affecting youth. We focus on constructive social skills that are essential to success, particularly for kids whose opportunities are limited. DAREarts is a Canadian charity that empowers kids at risk to unlock their potential and be leaders. By harnessing the power of the arts and the DARE values, they DARE to ignite change. Since 1996, DAREarts has empowered over 220,000 young people with the confidence and courage to lead beyond adversity. STRATFORD FESTIVAL: This acclaimed repertory theatre presents a seven-month season of over a dozen plays in four venues, with Shakespeare at its core. Since 1953, the Festival has welcomed more than 28 million theatregoers from around the world. It has been committed to arts education for decades, Visit www.stratfordfestival.ca. DAREarts is grateful to our National Supporter is Northbridge Insurance; Lead Supporters: Anne Livingston; Scotiabank, TD, Bank of America Merrill Lynch, RBC Royal Bank and The Ontario Arts Council, an agency of the Government of Ontario; and our Stratford camp supporters: an anonymous foundation and The William & Nona Heaslip Foundation.